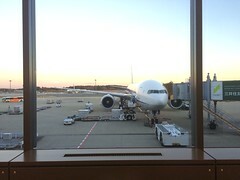 The return trip was much less grueling than the flight over: no overnight airport transfers in Japan this time around — though Chicago O’Hare was a pain to transit through, what with the standard bag re-check and a broken airport tram that forced us into a taxi for a terminal transfer. We flew out of NAIA Terminal 3, where the souvenir shop had mannequins dressed in local tribal chic. 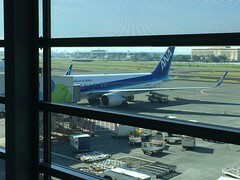 On-time takeoff aboard an ANA 767-300. 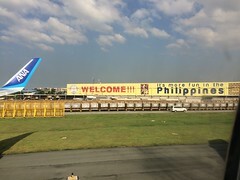 Last we saw of Manila was the “More fun in the Philippines” welcome sign. 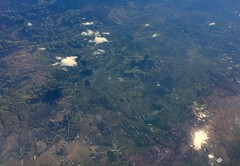 On the way out we had a great view of Central Luzon and the Quezon coast. Inflight film when I wasn’t looking out the window: All The President’s Men. 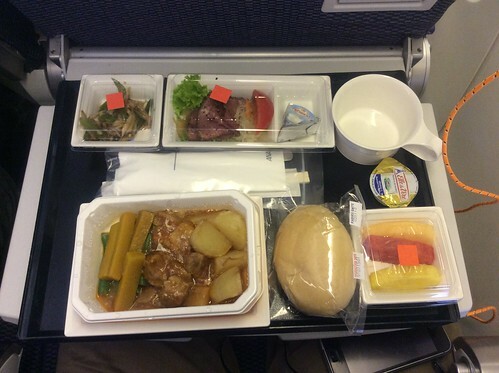 Inflight meal: pork goulash. 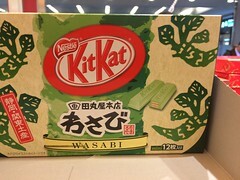 Five hours later we were in Narita Airport for a two hour layover: just enough time to to eat udon noodles and Sapporo beer at the Avion Cafe & Bar, and buy some wasabi-flavored KitKat at the gift shop. 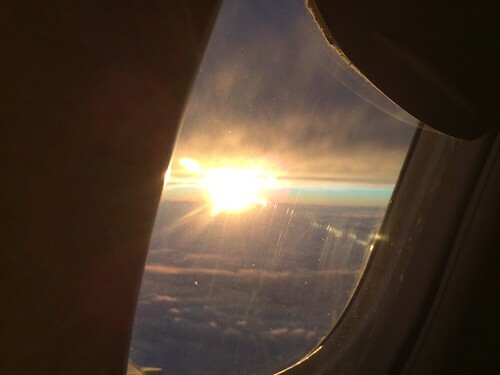 Then it was 12 bumpy hours to O’Hare in a window seat beside the rather loud engines of an ANA 777-300. (Still a bit less bumpy and much faster than the outbound trip.) 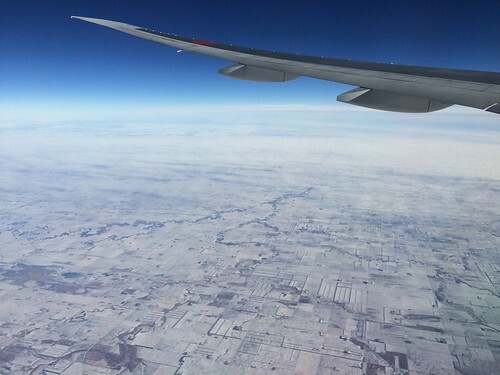 Late in the flight came daylight, with lovely views of a snow-covered North America. 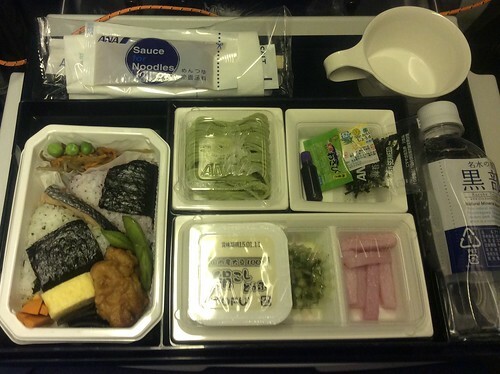 Inflight meal was a delicious seafood-and-onigiri bento box, with ice cream. O’Hare Airport was horrible. We landed at Terminal 5 and needed to transfer to Terminal 2, but the only means of transfer, the airport tram, had broken down. With less than an hour left to transfer after immigration, customs, and bag re-check, we abandoned the crowded tram station and followed signs for the “airport bus”, hoping that this would provide backup transport between terminals. There was no bus; just a concrete wall out in the snow. We ended up taking a taxi to get to Terminal 2 in time to make our transfer. The cab driver was understandably frustrated as he had been waiting two hours in line only to get a fare for a short terminal transfer; but I gave him a giant tip for the trouble. En route we passed by a stuck airport tram, stalled on the tracks and full of people. 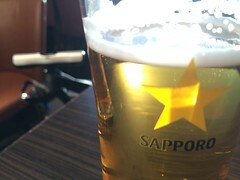 If we’d waited with the crowd, we’d have missed our flight. Smooth flight home otherwise, aboard an Embraer E170. We landed at DCA after sunset and got out of the airport pretty quickly. I was pretty relieved that I still remembered how to drive after two weeks away. Cats were happy to see us.